Surface tension is a fluid property that dictates the behaviour of droplets and bubbles. It is important for many applications, such as industrial processes where fluids are mixed, for multiphase pipe transport, for biological processes such as in our lungs, and when we do the dishes. It is possible to measure the surface tension using different setups in the lab, but if we can instead predict through simulations accurate values for the surface tension, it is easier, quicker and cheaper. This is especially so when we are interested in the surface tension at high pressure and temperature. Both within academia and in industry molecular dynamics simulations have seen wide spread adoption e.g. for the prediction of fluid properties, and every other year there is a competition called the Industrial Fluid Properties Simulation Challenge where the best simulation teams in the world face off. In the latest edition, yours truly from SINTEF Energy Research was part of the team that took home the grand prize. The task at hand was simulation surface tension between water and three different oil mixtures at elevated pressure (18.25 bar) and four high temperatures (110, 130, 150 and 170 °C). The benchmark for the results was given by accurate lab measurements that were performed at Dow Chemical before the competition started and kept secret until after the deadline for submitting entries. When we calculate surface tension through molecular dynamics simulations, a popular approach is to consider an elongated box that covers a very small area of an imagined drop surface. Inside this box, different molecules representing different fluids jump around and interact, as seen in the figure below. Snapshot from molecular simulation: In this case water (to the left) is in contact with an oil mixture containing dodecane and toluene, here at 150 °C and 18.25 bars. The green, triangularly shaped molecules represent toluene, while the grey, linear molecules represent dodecane. Some water can be seen in the oil phase, but the water phase is free of oil. When you zoom in this far, the surface is in practice flat, and the surface tension is computed from the difference in the diagonal components of the pressure tensor along the surface versus normally to the surface, the latter corresponding to the overall fluid pressure. 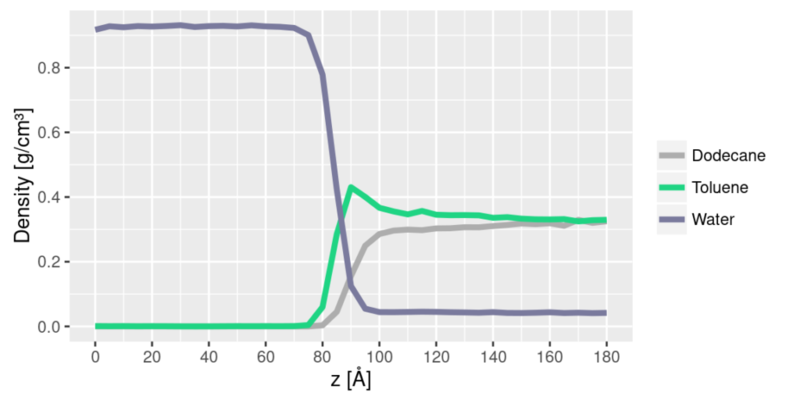 One also gets information about how the components are distributed in the various phases, as seen in the plot below showing the density of various components along the box. It is seen that the water is oil free, while the oil contains some water, and one can also see the preferential adsorption of toluene at the water interface, a typical feature due to the polarizability of toluene. Plot of the density of the different components along the simulation box. It is seen that the water is oil free, while the oil phase contains some water, and that toluene is preferentially adsorbed at the Interface. The Industrial Fluid Properties Simulation Challenge (IFPSC) is a competition arranged at regular intervals by CoMSEF, a consortium formed by the AIChE, ACS, NIST, Boeing, Army Research Labs, 3M, Dow Chemical and United Technologies Research Center. As the name suggests, the point of the challenge is to use molecular simulations to predict fluid properties of industrial relevance. Which fluids are involved and which property to predict changes from year to year, and the benchmark for the competition is set by the organizers by performing careful laboratory measurements before the start of the competition. The team matching best the values and trends seen in experiments takes home the grand prize. Yours truly participated from SINTEF Energy Research on one of the teams in this years competition, other team members being Dr. Carmelo Herdes of Univ. Bath, Dr. Andrés Mejia of Univ. 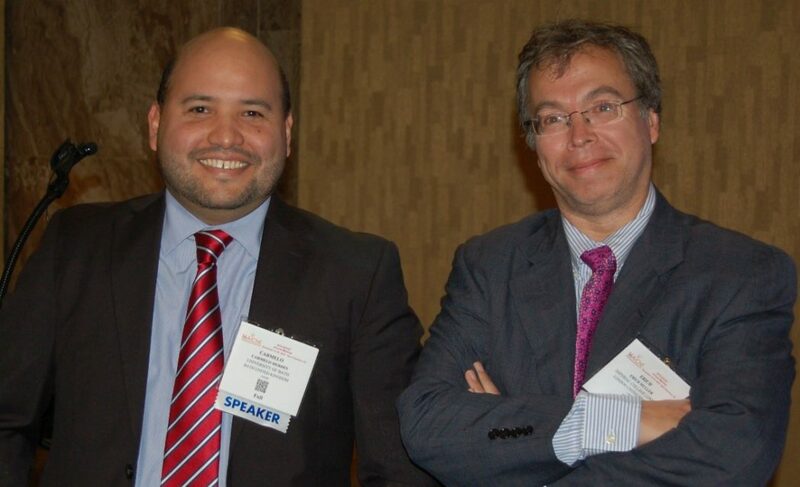 de Concepción, and Prof. Erich A. Müller of Imperial College London. I was responsible for running the production simulations, which were conducted at the University of Oslo GPU-accelerated supercomputer, and I also performed the analysis of the results. Together with the other team members, I have been working on similar simulations during my PhD that I completed in June last year. The simulation technique we are using is called coarse-grained molecular dynamics, where we use the SAFT-γ Mie force field that has been developed at Imperial College during the last decade. You can read more about the method in general and find references to the literature, as well as get started with your own simulations, by following this link. If you want to read more about the work we did for the competition, you can look forward to a journal publication that will appear later this year. To our excitement, our team won the competition ahead of some of the best simulation groups in the world. The second place went to Ilja Siepmann’s group at Univ. Minnesota, known for the TraPPE force field, while third place went to Huai Sun’s group at Shanghai Jiao Tong University, known for the COMPASS force field. Other competing groups included Walter Chapman at Rice University with their iSAFT-DFT method, Martin Andersson and coworkers from Copenhagen University using COSMO-RS, and Ioannis Economou’s group at Texas A&M using PC-SAFT. The victory was particularly satisfying given that many of the other methods used require much more computing power and are traditionally held to give more accurate results. Carmelo Herdes, Åsmund Ervik, Andrés Mejía and Erich A. Müller, “Prediction of the water/oil interfacial tension from molecular simulations using the coarse-grained SAFT-γ Mie force field”, submitted to Fluid Phase Equilibria, IFPSC Special Section, 2017.